I’m off to Murmansk first thing today as we change over teams on Saturday – so here is a quick round up of yesterday’s news. A really bright day yesterday with the air temperature up to 25⁰C; to make things more tricky there was a strong, albeit warm, upstream wind that made elegant, long casts somewhat rare. Compounding the issue was a river that continued to rise. I was sure yesterday morning that it would level out but I was wrong, we recorded a rise here at Middle Camp of another 5”. Pana this evening reported that it had dropped off a touch with them, so I would hope that by the time the next team start fishing in earnest on Sunday morning it will have settled down here. Even so we had a very productive and happy day landing 55 salmon, Dominique M being the only one to fish late in order to land a couple more fish to round off his week with 40 salmon to his rod. Pana had a quieter time and the team up there had a pretty relaxed day and, in shortened hours, had around 70 fish. 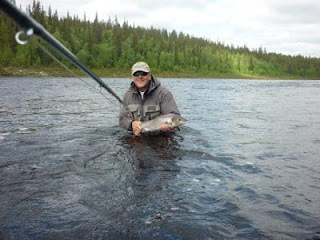 Tom at Kitza reported around 30 salmon landed. I’ll get the full news tomorrow evening and will do a roundup of this past week. It looks pretty good to me for the next week, a good water height and plenty of fish running. 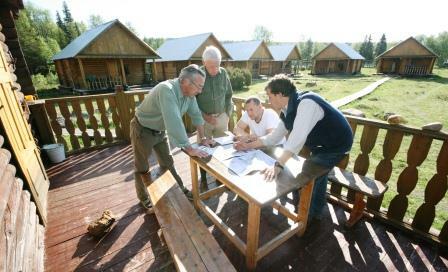 More news tomorrow when we have the new groups in camp. 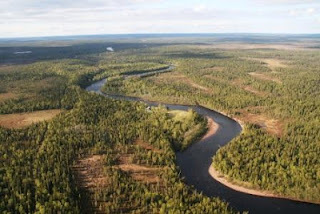 Such is the nature of the Varzuga watershed, consisting solely of virgin tundra and bog, that even heavy rain takes a day or so to percolate through to the river. We must have had more rain than we thought on the 12th and 13th June as yesterday the many small streams that feed the river were noticeably full and noisy and the river continued its slow rise. At Pana (80 km upstream from us here at Middle Camp) our manager, Mungo, reported the river to be well up, 9” over two days and getting a boat down to the holy grail of Ponzoi should be possible for a few more days. At Middle, where the river is wider, the total rise of water height is 6 ½” (17 cm), causing us to adjust the beats to make the most of the changed conditions. yellow, red and orange remain the favourites. people's minds when they reflect on their trip here. ﻿﻿﻿﻿At Middle Camp we landed 78 fish with Ian S reaching a remarkable land mark for a salmon fisher landing 100 salmon in five days fishing. reluctantly boarding the helicopter back to Murmansk on Saturday morning. ﻿﻿﻿﻿﻿﻿We look set fair for next week – the rise in water has come at a perfect time and the river looks in excellent shape. The rain of Tuesday night continued most of yesterday, accompanied by an upstream gale in the morning. Pretty foul conditions and here at Middle Camp we kept the generator on all day in case anyone took an involuntary swim and needed a warming shower, we lit the fire and brought everyone back into the lodge for lunch. The river rose slowly throughout the day, on the radio last night the camps reported the casting into the wind tricky and the fish fickle. 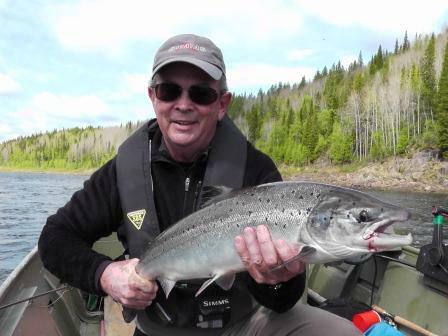 The score sheets were down a bit with Kitza recording 45 salmon with the biggest of the day at 14lbs to Ed B. The river had risen by 3½” triggering a landslide at Clay View which coloured up the water for the lower beat so Tom moved the whole team up-river. This morning the water had cleared and they will be able to put a couple of rods below camp into the ever productive Sasha’s Pool. Up at Pana the team of eight rods had 102 fish for the day taking them past an extraordinary milestone of 8,000 salmon landed and released in 21 years of fishing here. The river up there has risen 4” in the past 36 hours and all the lower pools remain accessible. 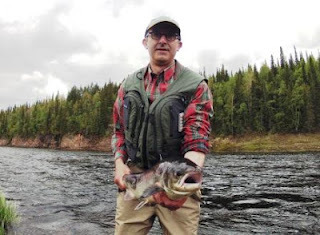 At Middle the fish were a bit dour, but I guess that statement needs to be put into a wider context – we finished with 78 salmon for 11 rods, not exactly a disaster in salmon fishing terms. Everyone one had three fish or more for the day, again Ian S, Richard L and Dominique C leading the way with double figure scores. There was no doubt that the fish had their heads down a bit, after dinner the weather calmed so Ian S, Hugh and I took the boat down to Party Pool to experiment. Ian fished his trusty fly, The Mediator, on a very short slow sinking tip while Hugh and I took turns with either a Bomber or skated Sunray Shadow. In an hour and a half Ian landed four (one a cracker of 14lbs) and lost one; while not a single fish showed to the surface flies. The river should settle down today, it is up 4” at Middle which gives us a bit more lee way for the jet boats, the weather is cooler and brighter and there is a light breeze. 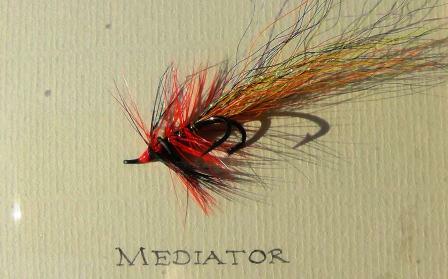 Everyone has been digging around in their fly boxes for Mediators and Hugh has been busy at the fly tying bench. We’ll see what happens today, so far this week 27 rods on the Varzuga and Kitza have landed exactly 1,111 salmon in four days. Not too bad! Yovas Rapids are at the head of the Middle Camp’s beat, 2½ miles of white water and wonderful ‘lay-bys’ for the running salmon to rest in on their haul up the steepest section of this long river. 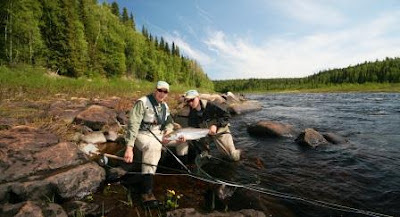 Early in the season the fish pause at Clarkes right at the bottom of the rapids, making Clarkes probably the most sought after spot on the beat rotation. Now, with the water temperature above 10⁰C, they tend to run through Clarkes pausing in the myriad of perfect pools throughout Yovas. 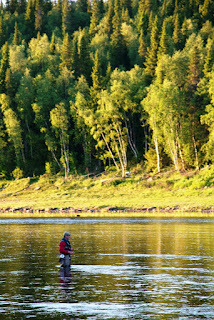 ﻿﻿﻿ The jet boat ride up the rapids gives the day a feeling of expedition, you pull into the bank, the engine is cut, and suddenly you realise you are genuinely in the middle of nowhere, just a mile or so south of the Arctic Circle, in the most beautiful place on the Varzuga with more fantastic fly fishing water than you can possibly cover in the day. 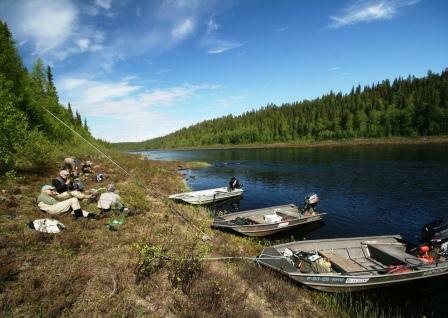 Truly fishing heaven. I ran my boat up Yovas to meet Graham B, David KW and Ian S for lunch, a fresh salmon barbequed by Sasha; we relaxed on the bank and soaked in the silence of the wilderness. In the afternoon Anton guided Graham down the bank while I took David in my boat. I made a couple of indifferent decisions about where to fish and by mid-afternoon, much to Anton’s delight, Graham was well ahead on the score board. Eventually we got it right, just above The Slabs, and in an hour of mayhem David landed four, lost four and had numerous aggressive and splashy takes. We sat in the boat quietly contemplating the day, David said “I wonder if people realize that it is a privilege to fish Yovas”. 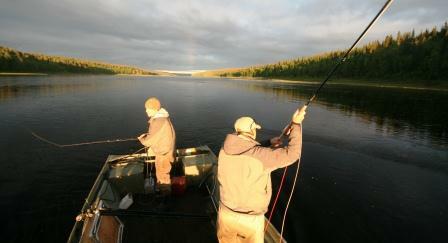 At Middle Camp we ended the day with 103 salmon in the book, Kitza reported 55 with Joshua C landing 15. 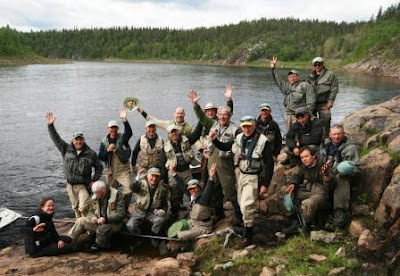 Pana had a cracking day with 136, one guest fished late to get to a remarkable score of 50. 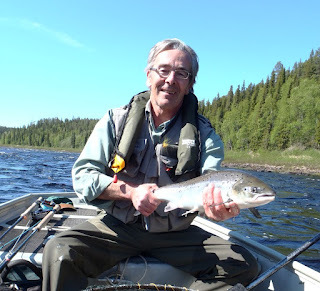 It was a bright day and the water temperature rose to 15⁰C; floating lines are now the best choice and flies of 1” or less are working well. More tomorrow from the wonderful Varzuga. Yesterday was probably one of the best I have witnessed up here on Varzuga. The weather was perfect with mixed cloud and sun, a light breeze, few if any mosquitoes, the water height at summer level and the water temperature (even on Kitza) at 12⁰C. Ideal floating line conditions and with the huge run of fresh salmon continuing it was difficult to imagine a better place for a fisher to be. 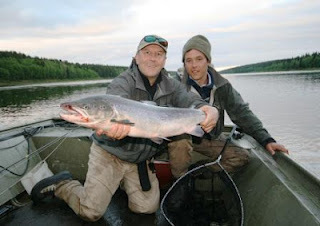 Over at Kitza Tom reported their best day of the season with 59 salmon, Ian B leading the way with 14. After getting his first salmon very soon after arriving on Saturday night Ed B put another three on the bank to get his fishing career off to a remarkable start. Pana had 106 to the eight rods with the catch evenly spread amongst the team, some of whom have fished here for many, many years. They tried the float trip for the first time this season with great success and that will now be a much anticipated event for two guests per day. Here at the Middle Camp Hugh took Sebastien R out in the morning to settle him into salmon fishing and he landed his first two fish in Bear Pool; meanwhile Graham B had his best morning ever with 10 fresh fish from Simmonds. In the afternoon Ian S undertook an extreme wade through Eagle Rock and was richly rewarded with 19 salmon landed and five lost – taking his total for the day to a staggering 30. The camp total was 105, putting them one behind Pana for the day – Hugh is not that happy to be beaten by Pana for the first time this year and there was an air of determination at the morning briefing. ﻿Last night I ran a boat down to the Lower Camp to collect some supplies and on the way back was amazed at the number of fish running and porpoising their way up river. 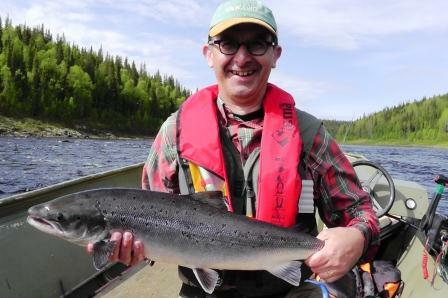 Not only have we had a really good run of salmon this year but the average size has been noticeably larger with many 8lb – 12lb really fit and strong fish. This morning there was a distinct buzz of excitement at breakfast, Barbara C had landed three and Ian S four before they tucked into their scrambled eggs and bacon. 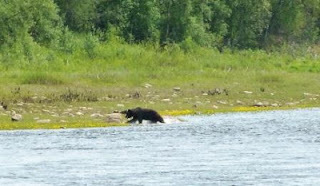 Today we are sending two groups right up Yovas rapids to explore the prettiest beat on the entire river. Once I have this blog posted I’m off to join them! Murmansk airport was wonderfully noisy yesterday, the upstairs bar was packed for a couple of hours as the outgoing parties met up and compared notes and the incoming groups urgently de-briefed them for information on water height, hot spots and the best flies to use. Getting ready - 30 minutes after arrival! The decibel level at the bar was understandable given the extraordinary catches; last week Kitza finished with 310 salmon to 8 rods, Middle had a staggering 907 for 10 rods while the team of 8 at Pana landed 496. 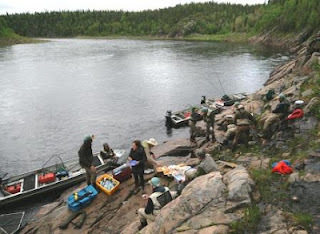 I’m not sure yet of the total score for the Ultimate Salmon Fishing Course that we held at the Lower camp, but it was in the region of 350 salmon for 9 fishers. Vintage stuff! The group coming into Middle Camp came in in two parties, the second a few hours after the first. As we made our final approach, low over Generator Pool outside camp, Richard L was lifting a 10lb bar of silver out of the water for us all to see from the helicopter windows. 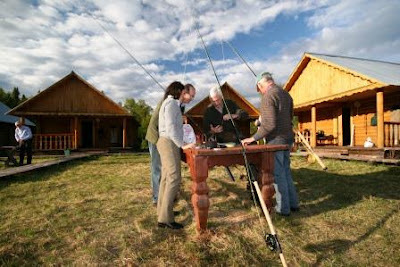 The excitement in camp was infectious, rods were hastily assembled, dinner was rather quick and by mid-night the rods had banked 11 salmon before retiring for a well-earned sleep. Summer is in the air now, the water temperature is 12⁰C and the height, although a little above average, is ‘summer height’. Perfect for floating lines and before breakfast this morning Ian S had a salmon on a single handed rod and small skated tube. I talked to Kitza this morning to hear that Ed Billson from Australia had landed his first ever salmon after dinner last night and there was, I gather, ‘a bit of a celebration’. Another update from Varzuga tomorrow when I can report on how the first day of the week has gone, it was very bright first thing but is now clouding over nicely – looks good!